Is It OK to Be Fat? First, yes … some people are obese because they have a legitimate medical disorder. My heart sincerely goes out to them. Chances are that’s not you. If you are obese, it’s likely diet and exercise. You know this, right? There are, of course, a number of other causes of obesity recognized by the medical community, but as you can see most of them directly result in changes in diet/exercise patterns. The intention of this post is to motivate you to consider changing them, not to shame you. So, is it OK to be fat? Yes, it’s OK to be fat … if you are OK with having a heart attack or stroke. It’s OK to be fat if you’re OK with having diabetes. It’s OK to be fat if you are OK with erectile dysfunction. It’s OK to be fat if you want to experience the joy of your stomach acid eating away at your esophagus. It’s OK to be fat if you are OK with cancer. It’s OK to be fat if you are OK with liver disease. It’s OK to be fat if you are OK with sleep apnea. It’s OK to be fat if you are OK with osteoarthritis. It’s OK to be fat if you are OK with infertility. It’s OK to be fat if you are OK with depression. It’s OK to be fat if you are OK with gallstones. It’s OK to be fat if you don’t want a date. It’s OK to be fat if you are OK with polycystic ovarian syndrome. It’s OK to be fat if you are OK with hypothyroidism. It’s OK to be fat if you are OK with chronic lower back pain. It’s OK to be fat if you are OK with knee pain. It’s OK to be fat if you are OK with the stress of irregular menstruation. It’s OK to be fat if you are OK with a lowered IQ. Are you growing tired of this list? I could go on, you know …? 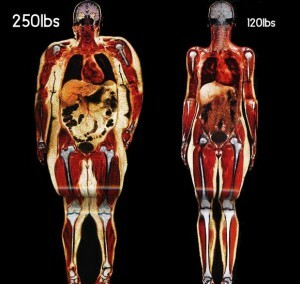 Now, it’s very possible that obesity is not the “cause” of these health issues. It’s altogether possible that whatever in your life is causing the obesity is also causing the other health issues. Toe-may-toe toe-mah-toe … The correlation suggests that if you remove the cause of obesity you’ll likely be removing the cause of the other diseases as well. So, what’s it going to be? We’re 7 days out before the experiment begins. Are you in? Sure, eliminating sugar and alcohol from your diet is unlikely to turn you into a bronzed Adonis, but it’s a start – and we all have to start somewhere. I don’t know about you, but I have this nagging feeling that we live in a very significant time that will require more from us. (I’m talking about the pace of technological and social change here … not the Mayans … by the by.) Don’t we owe it to our loved ones to be ready for whatever is coming? I do.